The Torah I am reading from today has a very special history. Our congregation, Chavurat Aytz Chayim, which means Tree of Life, received this in 1977, just a few years after the congregation formed under Rabbi Mark Golub.The Torah was loaned by the Westminster Synagogue in London, and is one of 1,564 Torah scrolls saved from Nazi Europe. This Torah was written in 1900 for a Jewish congregation in a small town called Milevsko in Czechoslovakia. During the Nazi occupation of this area of Czechoslovakia, known as Moravia, the Germans sent most of the Jewish population to concentration camps, virtually wiping out the entire Jewish community. The Jews of Milevsko, a town in Bohemia located south of Prague, had lived in there since the mid-1600s. They were deported to Terezin and Tabor, (concentration camps) during Nov. 12-16, 1942. As they decimated communities in Czechoslovakia, the Nazis collected Jewish religious articles that they were going to display in an exhibit to be known as “Relics of the Extinguished Race.” The religious objects were sent to Prague, when Jews there were ordered to sort and classify the items. The work was done in the town of Michle. When the Allies defeated the Nazis, the Jewish Museum in Prague took control of the religious items. But they remained deteriorating in the basement in the synagogue as Jewish leaders tried to figure out a way to protect them. In 1963, a London arts dealer contacted a Jewish historian, Chimen Abramsky, who looked at the scrolls. As he examined them, several items were discovered, including a note that fell from a scroll that said, “Please God, help us in troubled times,” One Torah had spots of blood on it. 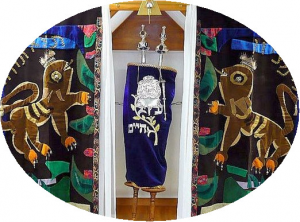 That year, with the help of Abramsky and the art dealer, the scrolls were sent to Westminster Synagogue, which oversaw the restoration of the Torahs. More than 500 of the restored Torahs have since been loaned to congregations across the world, including Israel, South Africa and Germany. One of the Czech Torahs resides in the White House, presented to President Jimmy Carter after he addressed the World Jewish Congress in 1977. I see this as a great honor to be reading from such an old and special Torah. It is very meaningful to me that this Torah survived poverty, war and deterioration. So today, when I read from it, we should remember the Jews of Milevsko.